Europe's export powerhouse is stalling. Germany has just experienced its biggest monthly fall in exports in more than six years -- and that was before the Volkswagen scandal broke last month. Exports slumped by 5.2% in August compared to July, while imports were down 3.1%. That's the largest drop in exports since January 2009, and a lot worse than expected. Economists predicted a slump of only 0.9%. 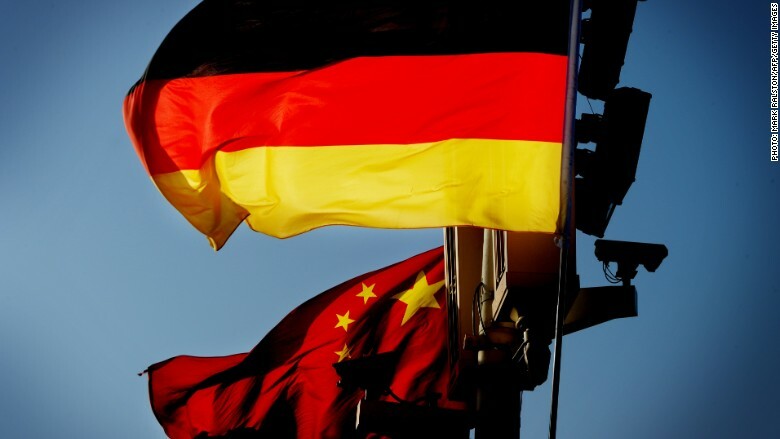 Researchers at the Ifo Institute for Economic Research in Munich said German exports are taking a hit from slowing demand from emerging markets, especially in China. "Weak conditions in emerging markets are an increasing headwind for the export-oriented German economy," noted Dominic Bryant, an economist at BNP Paribas. The boost exporters got from a weaker euro in the first half of this year is also fading, Ifo said in its latest forecast. The poor trade news completed a trio of bad reports from Germany this week. The country's manufacturing output and industrial orders also showed a slump in August. Germany is Europe's biggest economy and any significant slowdown in its growth will hurt the region's recovery. The International Monetary Fund expects Germany to grow by 1.5% this year -- in line with growth for the eurozone as a whole -- and by 1.6% in 2016. The IMF said earlier this week Germany could do more to boost its growth, by investing in infrastructure and carrying out more reforms to its economy.